A woman has reportedly revealed how she wanted to destroy prophet T.B. 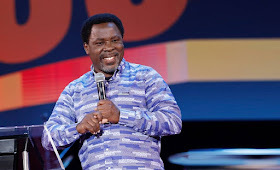 Joshua, the General Overseer of The Synagogue, Church Of All Nations (SCOAN) during his last crusade in Peru. According to the lady, a huge force restricted her from attacking the pastor when she got close to him. Uncontrollably welling within, her anger reached bursting point. Only one devilish thought flashed incessantly through her mind - to destroy TB Joshua at all cost. Rushing towards him in a violent fit of rage, a supernatural force suddenly hit her, crashing her to the ground. Evil was defeated!